Well. I now know one thing for certain: I need to see this movie. I need to see whether it measures up. Given the Oscars and awards and attention the movie got, I’m guessing it’s in the ballpark. This book is quirky and deals with mental illness in a unique way. We are told the story from the perspective of Pat, who has just been released from “the bad place” as he calls it – a mental health facility. We don’t learn what he did to put him in there until much later in the book, and it’s never quite clear what has happened to his mind, but he is obsessed with reuniting with his now-estranged wife, Nikki. In the spirit of trying to get Pat to move on, his brother and sister-in-law try to set him up with SIL’s sister Tiffany, who herself is struggling with the loss of her husband, and who herself is suffering from some mental issues. Though at first there is no attraction at all between the two, their relationship develops in a strange manner. Pat believes his life is a movie and should get a proper movie ending and tries to see the silver lining in every dark cloud; but through learning to accept that Nikki is gone, he begins to see that life doesn’t always turn out the way we want it to. The “playbook” aspect of the title comes from the fervent fandom of Pat and his family of the Philadelphia Eagles. Football is the only language Pat and his father have in common. And it is through football that their relationship begins to heal, although on game days after a loss, everyone suffers the wrath of Pat’s father. 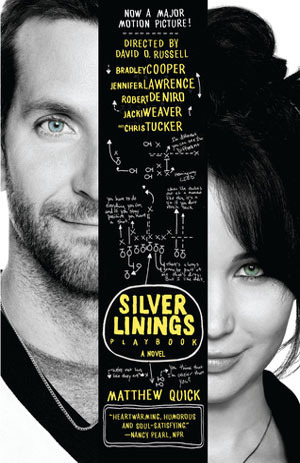 At around 300 pages, I was surprised at how quickly I was able to read Silver Linings Playbook. 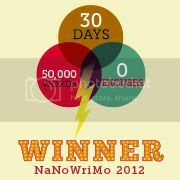 That is a testament to the excellent writing as well as the subject matter. I am interested to see how Bradley Cooper does in the role of Pat. I think of him as a fluff movie actor – for instance, see his work in the Hangover franchise – so to see him in a somewhat serious role will be a switch. And as for Jennifer Lawrence, I am a fan, so I am sure she nails the role of Tiffany. Gotta give this one huge thumbs up – read the book and see the movie, just as I plan to do. I’m the opposite–I’ve seen the movie, but never read the book. I really liked the movie (Cooper and JLaw were both great in it, in my opinion). Nice review! I’ll have to check out the book.